You can never start preparing for pregnancy too early! From your emotional to physical well-being, its important to ensure all aspects of your life are well-prepared. After all, those nine months will fly faster than you think, so having things done ahead of time will allow you to have more time to actually enjoy your pregnancy. Planning properly for your baby means taking the right vitamins and eating a healthy diet. Consult your doctor on what you need to do to get your body ready for pregnancy. Preparing yourself both emotionally and physically is a fundamental part of getting ready for pregnancy. In fact, having regular pre-pregnancy health checkups can help improve your chances of getting pregnant by maintaining reproductive health. Learn more about the importance of talking to your doctor about getting pregnant before you actually become pregnant and find out about genetic testing, the importance of folic acid supplements, prenatal vitamins, healthy diets, and light exercise. Getting your body ready for pregnancy may help you get pregnant easier and will also ensure the best possible start for your yet unborn baby. You will need to think about the financial responsibilities that come with having a baby. Discus with your partner about how you'll might budget for a baby, including how to find the right health insurance and tips on minimizing the financial effects of maternity leave on your family's budget. Plan to put money aside each month for baby expenses and speak to friends about what having children will really cost you. While you're preparing for baby, you may also want to start preparing your marriage for the changes in your relationship a baby will bring. Think about how parenthood will change your marriage and prepare yourselves for the changes. Debating on another child? However you solve the Great Debate, remember to keep the lines of communication open. Learn how to have a productive conversation without it breaking out into a heat argument. You may also be wondering about your new family composition such as how many children to have, when to start trying, and child spacing. Be sure to talk about all of these issues fully with your spouse so that you know where you stand as a family. Find a compromise between what you each want and be sure you both agree on your family plans before you start to try for children. 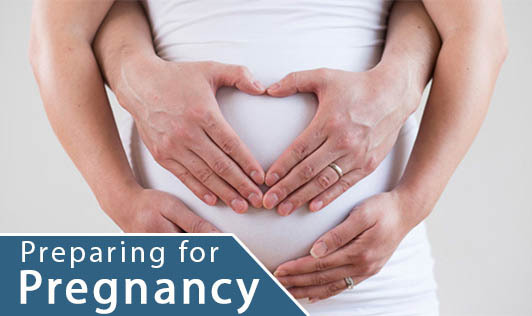 Preparing for pregnancy is not only a great way to get yourselves ready for what's to come, but it can also help you and your partner to solidify your desire to become a parent.